Are you interested in touring your state’s forests and wood product mills? Do you want to learn more about sustainable forestry and how to connect what you learn in the field to the classroom? This summer, immerse yourself in a multi-day teachers’ tour that includes training in curriculum materials with links to all the current academic standards. Across the country during the summer months of June, July, and August, teachers have an opportunity to tour their state’s forests, meet foresters, and learn about forest management practices, as well as how to connect what they learn in the field to the classroom. 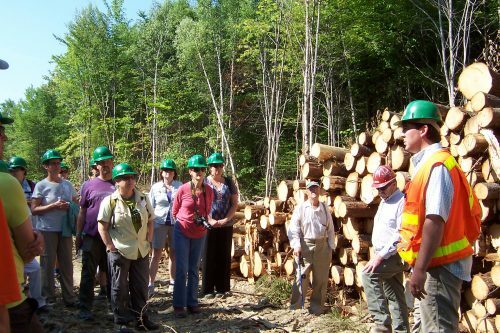 These multi-day teachers’ tours and week-long forestry institutes immerse educators in the social, economic, and ecological aspects of sustainable forestry. Teachers who attend these institutes receive environmental education training on how to use forests to teach across many subject areas, along with Project Learning Tree’s lesson plans and resources to use in their classroom. The lessons are correlated with your state’s academic subject area standards. The goal of these tours is to provide K-12 teachers with knowledge, skills, and tools to effectively teach your students about forest ecology and forest management. They provide balanced, science-based education and an understanding of how decisions are made about forests and their natural resources upon which we depend. You’ll spend a lot of time in the woods, meeting and learning from natural resource professionals in the field and seeing first-hand the work they conduct on a daily basis. You’ll examine forest practices and learn about working forests and the forest industry. You’ll discover the impact forests have on your state’s environment, economy, and quality of life. You’ll engage in discussions about forest issues with natural resource professionals, community members, and other educators. You’ll have time for lesson planning to help you prepare for back to school along with ways to engage your students in critical thinking by exploring the complex issues involved in managing the natural resources on both public and private forestlands. Some of these tours are free (including all meals, transportation and lodging) thanks to sponsors in each state who cover the costs. Some states charge a nominal fee, around $200. Participation is limited, usually between 25 to 35 participants and staff. Both formal and non-formal educators may apply for a tour, although preference is sometimes given to full-time classroom teachers. In most cases, teachers can earn continuing education credits, college credits, or professional development credits from your school district. Learn more about these forestry institutes and teacher tours and find a summer professional development program in your state.